We often tend to accumulate a lot of stuff: dresses, shoes, bags, etc. I arrived in Quebec three years ago, and I only had a suitcase with me, which means not a lot of clothes. But in just three years I managed to accumulate a lot, more than I actually need. So the other day, I decided that it was time to clear up my wardrobe. I won’t say that I’m a hoarder. Even if I can accumulate a lot in no time, I have no difficulty in disposing of clothes, especially when they are damaged. But that day, I really wanted to go through my closet and not just to throw away what is damaged, but I wanted to give all the clothes I never wear and are still in good condition. You already know that I’m a big fan of lists. And because I wanted to be really effective and objective, I needed a good system. Once you have your system, you got to work! Put all your clothes out of your closet, it will help you to have a better idea of the task. It also allows you to clean your closet, which might be a good thing considering that we don’t do that very often. 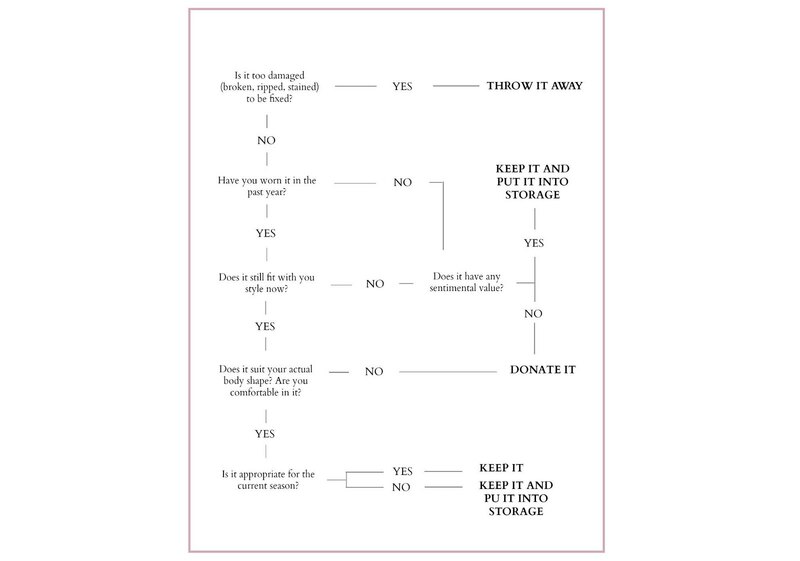 Personally, this system allowed me to dispose of a lot of clothes that I didn’t wore anymore, and I hope that someone else will make a good use of them. It also allowed me to store some summer clothes that I won’t wear for a few months, since here in Quebec, the temperatures are already beginning to be a bit cooler. The thing is, when you have a cleaned wardrobe, you have a lot of space. A lot of space for new clothes! I know, I know, this is not very reasonable… but I can see that my style is changing into something more classic and minimalistic, and I’d like to invest in some better quality items. But because I want to stay focused on what I really want, I need to be organised. My main sources of inspiration are Pinterest, magazines and of course fashion blogs. STEP 5: MAKE A LIST OF WHAT YOU « NEED » AND GO SHOPPING! This is the next logical step, once you know what you « need », then you go shopping. Where I live, there is not really a store that sells clothes of my style (welcome to the countryside! ), so I tend to shop mostly online. But I prefer it like that, I noticed that like to be in the comfort of my sofa. It also allows me not to spend too much, because I know what I want, and I go directly where I need to go to find it, no distraction. To be really honest with you, I haven’t reached that step yet. I’m still looking for the organizing system that would be most appropriate for my closet. Currently, I sorted out my clothes by category (skirt, dresses, T-Shirts, etc.) and colors, but I still need to find storage boxes for my underwear and all that stuff. It feels so good to have a new wardrobe, filled with clothes that I really like, that I will wear for real, and in which I feel comfortable!